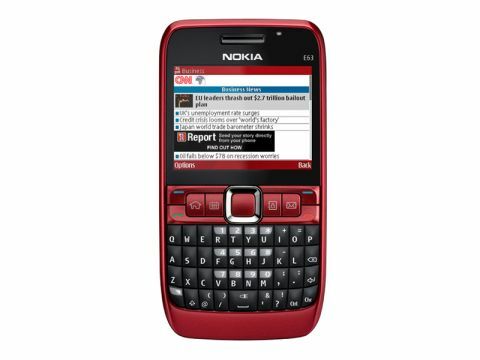 Of course a reduced price version of an earlier phone is bound to have some omissions, but Nokia has done a good job of lessening the blow with the E63, essentially a budget version of the Nokia E71. Sensibly, they've kept the important stuff, and in some cases even improved it. The E63's key selling point is its QWERTY keyboard, which is a slight improvement on its predecessor's by dint of being a couple of millimetres wider, with slightly larger keys. The original wasn't difficult to use, and this one is a breeze, with rounded keys of rubberised plastic offering good purchase to nimble thumbs and just the right degree of feedback. Helpfully, it even beats similar keyboards from the likes of BlackBerry by including one-touch access to essential characters like the full stop and @ symbol. Like the BlackBerry, it's easy to set up push email accounts (all you'll need in most cases is your email address and password) and it can work with most of the major email standards, including Microsoft Exchange, Hotmail, Gmail, Yahoo! Mail and others, though not BlackBerry Connect. The E63 feels a little cheaper than the E71 with plastic replacing the metal skin of the older phone. The E63 is slightly thicker too, though it still manages to be a gram lighter. Around the sides are micro USB port and microSD card memory slot (none is supplied) plus a 3.5mm headphone jack on top. But there are no volume buttons (you can use the D-pad while making a call or listening to media instead), voice notes button or camera shutter button. The web browser is a practical one, which does what it needs to with a minimum of style, but it delivers the goods. Zooming, address bar and keyword search can all be accessed via shortcuts on the numeric keypad and there's a useful option that breaks down web pages into sections for easy navigation. There's 3G access to the web, albeit without the faster HSDPA connection of the E71 though there's also Wi-Fi for access to broadband networks. The camera is probably the E63's biggest disappointment. The 3.2 megapixel version on the E71 wasn't particularly impressive, but this 2 megapixel number feels distinctly underpowered. There's a single LED flash and self-portrait mirror plus a 2x digital zoom, but pics in anything less than excellent lighting conditions are prone to grain and even then colours appear washed out. Video is worse, offering just 15fps and tending to be jerky and smeared with movement. There's not much in the way of post-pic editing options either, just zoom and rotate. The media player goes some way to redeem the E63, with video via RealPlayer performing well on the 320x240-pixel, 16m colour screen and although there are only 110MB of onboard memory for vids and tunes, you can add up to 8GB by microSD card. There's also an FM radio with up to 50 presets – more than enough for any radio fan – and while the supplied headphones are bog standard, you can add your own via the 3.5mm headphone jack. There's no GPS on board, although Nokia Maps is here. You can make use of it by connecting up to a GPS receiver via Bluetooth. An odder omission is the fact that it doesn't come with a data cable – you'll need to buy one separately if you're planning to connect to your PC - which, considering the potential of this powerful smartphone, is very likely. The battery held up very well, giving us a good three days of moderate use including video watching and some web browsing with Wi-Fi turned on throughout. The E63 cuts a few corners on its predecessor's offering, but aside from the relatively poor camera, and the lack of GPS, there's nothing major missing. If you can't quite stretch to the E71, and want a worthy alternative to a BlackBerry, look no further.